One of the most beloved nuts is by far the cashew. This kidney-shaped nut is a relative of the mango and pistachio as a member of the anacardiaceae family. 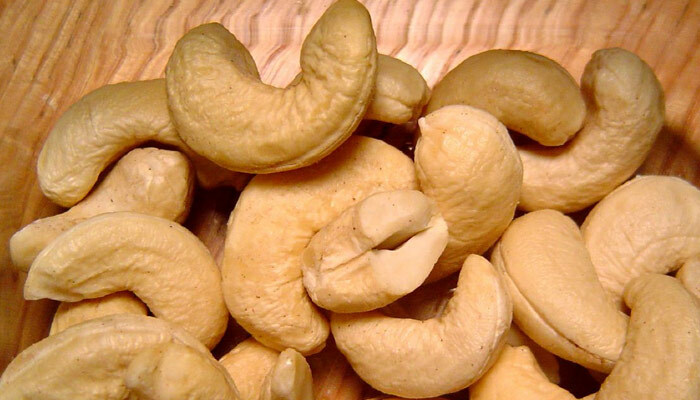 Cashews are actually seeds attached to the bottom of a cashew apple. Encased in a toxic shell, cashews are removed from them before consumption. The cashew tree is a native to northeastern Brazil. Visiting Brazil in 1558, French naturalist Andre Thevet provided the first written description and drawing of the cashew apple and cashew. During the sixteenth century, Portuguese explores introduced the cashew into other tropical regions including India and Africa. Cashews did not gain popularity until the twentieth century, and is second only to the almond as nuts important to world trade. Cashews are an excellent source of monounsaturated fats. They are also a good source of the minerals; copper, magnesium, potassium, iron, and zinc. Cashews also contain biotin and protein. A one-third cup serving of shelled cashews contains 260 calories. Cashews have a lower fat content as well as a higher protein and carbohydrate content compared to most other nuts. Fat found in cashews is mostly derived from oleic acid, a monounsaturated oil that can protect against heart disease and cancer. Cashews are a great mid-day snack that helps you feel full and energized. Combine them with other nuts and dried fruit for a sweet and savory trail mix. Try adding cashews to sautéed vegetables. For an easy sauce, heat cashew butter, tamari, cayenne pepper, garlic, ginger and water in a saucepan over low heat. Serve over fish, vegetables, tofu or rice. For more on the benefits of cashews and other nuts, take a look at my book, “The Encyclopedia of Healing Foods“.